Place eggs, milk, salt and pepper, and green chilies into a microwave-safe bowl or mug (I prefer a mug). Whisk with a fork to make sure all the ingredients are incorporated. Cook in microwave for 45 seconds. Remove. Re-scramble with the fork. Place cheese on top of egg mixture and put back into microwave. Cook another 30-60 seconds (depending on the wattage of your microwave…mine took another 40 seconds). Quick and with a delish kick, these eggs don't even dirty a pan! There is a certain freedom that comes with going off to college. Getting to eat what you want when you want is one of those freedoms. But trust me, after eating at the dining hall every meal you will soon miss Mom’s cooking, and miss it fast. But with little resources as a college student, how are you to cook? The microwave! Yes, really! 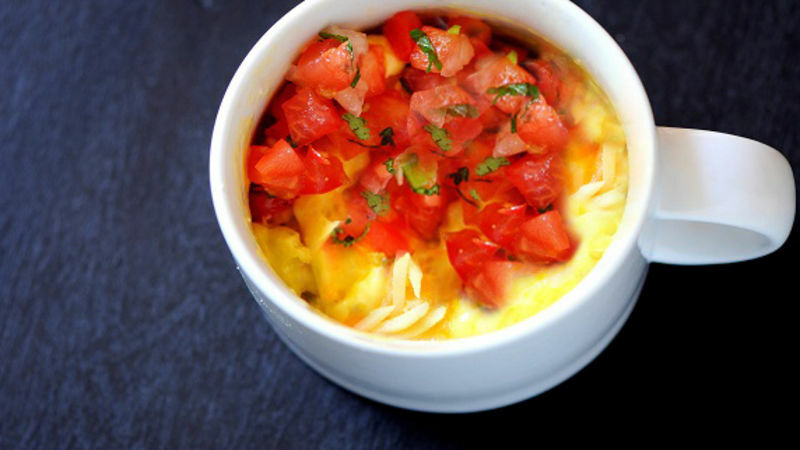 In no time you can whip up these Microwave Fiesta Eggs and have a delicious meal that can be made a million different ways. But I like them best with Old El Paso chilies in them to give them a little hint of heat. Not in college? No problem. Microwave eggs are a quick and easy way to get a good dosage of protein to your morning routine without much clean up. So whether you are a starving student or a busy mom on the go Microwave Fiesta Eggs are for you. Place eggs, milk, salt and pepper, and green chilies into a microwave safe bowl or mug (I prefer a mug). Whisk with a fork to make sure all the ingredients are incorporated. Cook another 30-60 seconds (depending on the wattage of your microwave…mine took another 40 seconds). Top with Pico de Gallo and sour cream and serve while warm.